If the atmosphere has an invariant optical thickness then surely all molecules should be included? 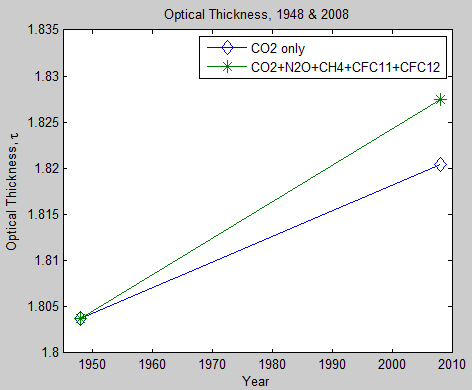 ..So if total optical thickness from CO2 and water vapor has stayed constant over 60 years then surely total optical thickness must have increased? I asked for more details (concentrations of each of these gases over time which were used for the calculations) which weren’t forthcoming. Only the H2O and CO2 gases were changed. Other minor GHG were held constant. So, working with this data I thought it would be interesting to see what changes had taken place in optical thickness due to these minor “greenhouse” gases. I should point out that there are substantial problems identified with Miskolczi’s theory and experimental work and this is a very minor issue – it is more of an interesting aside. 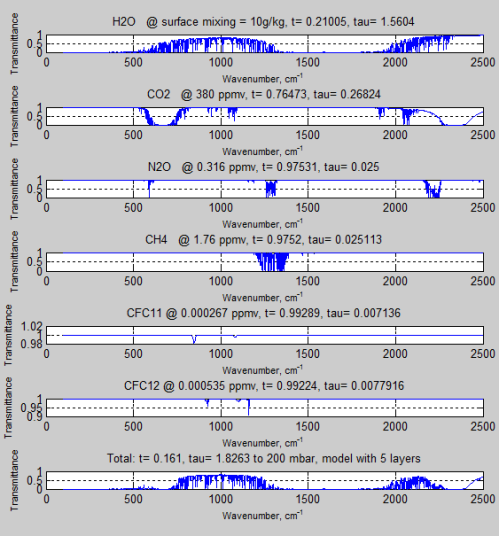 A little while ago I managed to recreate the CO2 transmittance in the atmosphere – as shown in Understanding Atmospheric Radiation and the “Greenhouse” Effect – Part Nine. This was done using the HITRAN database in a MATLAB model I created. The question about changes in optical thickness over time from other gases was a good motivator to update my MATLAB model to bring in other molecules. It was something I wanted to do anyway. Note that radiative forcing or (surface emission – OLR) is a much more useful value than total optical thickness (as explained in Part One). Extracting the HITRAN data proved to be the most tedious and challenging part of the project. It turns out that the “minor gases” like CFC-11 and CFC-12 are stored in a totally different format from gases like CO2, N2O, CH4 etc. These minor gases have a dataset for each temperature and pressure, with different sizes of dataset at various temperature/pressures. Nothing mathematically or conceptually challenging, just very tedious. Another challenge was working out what concentrations to use for 1948 – the start date that Miskolczi uses. From Collins (2006) it seemed that the main “greenhouse” gases to evaluate were N2O (nitrous oxide), CH4 (methane) plus CFC11 (CCl3F) and CFC12 (CCl2F2). There are other halocarbons to include but time is limited. The later CO2 value is from 2008 from Miskolczi’s spreadsheet while the other values are from 2005.
ppmv = parts per million by volume, ppbv = parts per billion (109) by volume, pptv = parts per trillion (1012) by volume. Earlier values of N2O and CH4 are taken from various papers, I can provide citations if anyone is interested – but pre-1980 values are thin on the ground. In any case, my calculations of total optical thickness are rudimentary and provided as a starting point. I used a 5 layer model up to 200mbar, with a surface temperature of 289K. 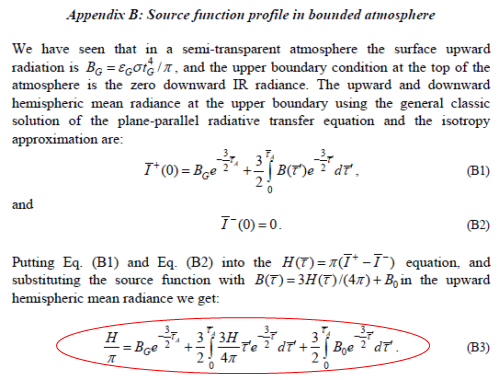 The diffusivity approximation was used to estimate total hemispherical transmittance (see Understanding Atmospheric Radiation and the “Greenhouse” Effect – Part Six – The Equations). The wavenumber step, Δν = 1 cm-1. The calculations were done from 100 cm to 2500 cm (4μm – 100 μm) and the “Planck weighted” transmittance (at 289K) was calculated. This transmittance was converted back to an optical thickness, which is the same approach that Miskolczi uses (see comment). Water vapor was assumed to be 10g/kg at the surface with a straight line reduction (vs pressure) to zero at 200mbar. Previously I carried out calculations where water vapor was varied from 5g/kg to 15g/kg and the effect on the transmittance change due to other gases was quite small. Water vapor absorption lines are included from the HITRAN database but the water vapor continuum is not. This is next in my wishlist to include. The model deliberately did not try to follow Miskolczi’s water vapor values. The point of this article is to demonstrate that if (and only if) CO2 optical thickness is canceled out by water vapor changes, then significant increases in optical thickness from other gases impact negatively on his hypothesis. Many people might not realize that there are a number of water vapor datasets. The one Miskolczi uses is not the only one. Others show different trends. Note that water vapor is included, but at unchanged concentration. The % increase (over CO2) due to the nominated “minor gases” = is 43%. The total optical thickness is not so important in this analysis. If the number of layers is changed, the total optical thickness changes, but percent changes due to “greenhouse” gas increases are roughly similar. If (and only if) water vapor has canceled out CO2 increases, then the increase in optical thickness due to these other gases (methane, nitrous oxide plus halocarbons) has destroyed the idea that optical thickness can be considered to be constant. Of course, my calculations are rudimentary. My model is much less exact than the HARTCODE model used by Miskoczi and it would be interesting to see his results reproduced in full with the correct concentrations of all of the GHGs from 1948 – 2008. As I commented earlier – this is one of the least important of the criticisms of Ferenc Miskolczi’s papers. In previous articles in this series we looked at a number of issues first in Miskolczi’s 2010 paper and then in the 2007 paper. The author himself has shown up and commented on some of these points, although not all, and sadly decided that we are not too bright and a little bit too critical and better pastures await him elsewhere. 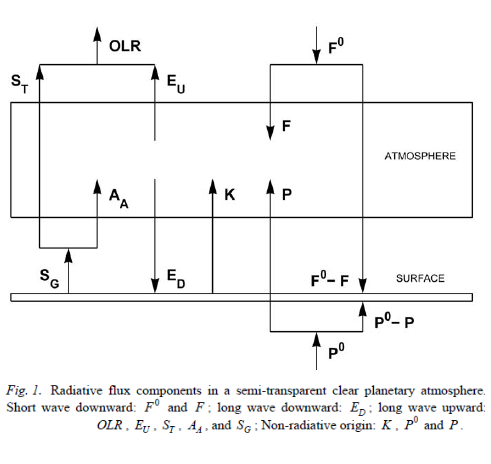 Encouraged by one of our commenters I pressed on into the paper: Greenhouse Effect in Semi-Transparent Planetary Atmospheres, Quarterly Journal of the Hungarian Meteorological Service (2007), and now everything is a lot clearer. The 2007 paper by Ferenc Miskolczi is a soufflé of confusion piled on confusion. Sorry to be blunt. If I was writing a paper I would say “..some clarity is needed in important sections..” but many readers unfamiliar with the actual meaning of this phrase might think that some clarity was needed in important sections rather than the real truth that the paper is a shambles. I’ll refer to this paper as M2007. And to the equations in M2007 with an M prefix – so, for example, equation 15 will be [M15]. Some background is needed so first we need to take a look at something called The Semi-Gray Model. Regular readers will find a lot of this to be familiar ground, but it is necessary as there are always many new readers. Simple models of complex systems have great heuristic value, in that their results illustrate fundamental principles without being obscured by details. In particular, there exists a long history of simple climate models. Of these, radiative and radiative-convective equilibrium models have received great attention..
One of the simplest radiative equilibrium models involves the assumption of a so-called grey atmosphere, where the absorption coefficient is assumed to be independent of wavelength. This was first discussed by Schwarzschild  in the context of stellar interiors. 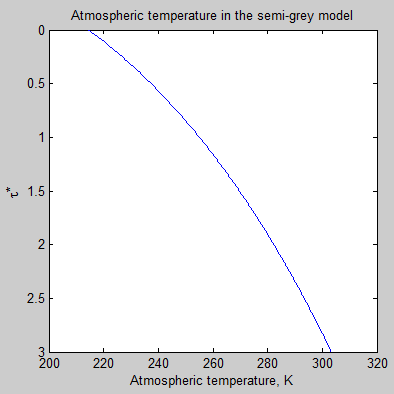 The grey gas model was adapted to studies of the Earth by assuming the atmosphere to be transparent to solar radiation and grey for thermal radiation. We will refer to this latter class as semigrey models. Radiative equilibrium solutions are the starting point in our attempt to understand how the atmospheric composition governs the surface and atmospheric temperatures, and the greenhouse effect. The Schwarzschild analytical grey gas model (SGM) was the workhorse of such attempts. However, the solution suffered from serious deficiencies when applied to Earth’s atmosphere and were abandoned about 3 decades ago in favor of more sophisticated computer models..
And they go on to present a slightly improved SGM as a useful illustrative tool. Some clarity on a bit of terminology for new readers – a blackbody is a perfect emitter and absorber of radiation. In practice there are no blackbodies but some bodies come very close. 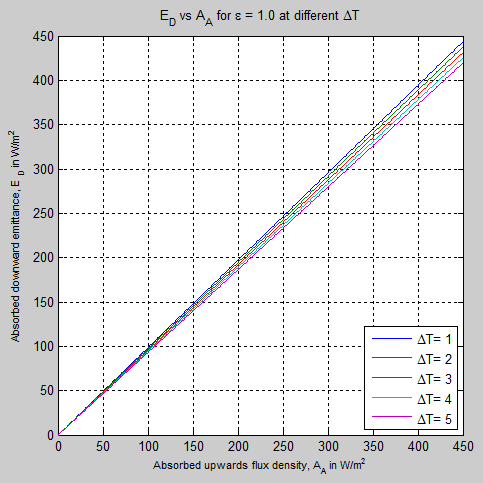 A blackbody has an emissivity = 1 and absorptivity = 1. So the emissivity and absorptivity vary hugely from one wavelength to the next (note 1). However, as an educational tool, we can calculate the results for a grey atmosphere – this means that the emissivity is assumed to be constant across all wavelengths. The term semi-grey means that the atmosphere is considered transparent for shortwave = solar wavelengths (<4 μm) and constant but not zero for longwave = terrestrial wavelengths (>4 μm). This model is very simple – and is not used to really calculate anything of significance for our climate. 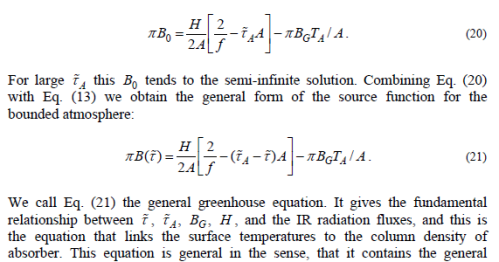 See Understanding Atmospheric Radiation and the “Greenhouse” Effect – Part Six – The Equations for the real equations. We assume that the atmosphere is in radiative equilibrium – that is, convection does not exist and so only radiation moves heat around. Once each layer in the atmosphere is in equilibrium, there is no heating or cooling – this is the definition of equilibrium. This means energy into the layer = energy out of the layer. So we can use simple calculus to write some equations of radiative transfer. 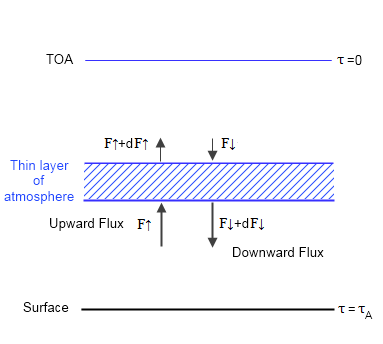 We define the TOA (top of atmosphere) to be where optical thickness, τ=0, and it increases through the atmosphere to reach a maximum of τ=τA at the surface. This is conventional. We also know two boundary conditions, because at TOA (top of atmosphere) the downward longwave flux, F↓(τ=0) = 0 and the upwards longwave flux, F↑(τ=0) = F0, where F0 = absorbed solar radiation ≈ 240 W/m². This is because energy leaving the planet must be balanced by energy being absorbed by the planet from the sun. We also have to consider the fact that energy is not just going directly up and down but is going up and down at every angle. We can deal with this via the dffusivity approximation which sums up the contributions from every angle and tells us that if we use τ*= τ . 5/3 (where τ is defined in the vertical direction) we get the complete contribution from all of the different directions. (Note 2). For those following M2007 I have used τ* to be his τ with a ˜ on top, and τ to be his τ with a ¯ on top. where B is the spectrally integrated Planck function, and remember F0 is a constant. Notice that the upward longwave flux at TOA is 240 W/m² – this balances the absorbed solar radiation. And the downward longwave flux at TOA is zero, because there is no atmosphere above from which to radiate. This graph also demonstrates that the difference between F↑ and F↓ is a constant as we move through the atmosphere, meaning that the heating rate is zero. The increase in downward flux, F↓, is matched by the decrease in upward flux, F↑. It’s a very simple model. By contrast, here are the heating/cooling rates from a comprehensive (= “standard”) radiative-convective model, plotted against height instead of optical thickness. And the heating and cooling rates won’t match up because convection moves heat from the surface up into the atmosphere. Note that if we plotted the heating rate vs altitude for the SGM it would be a vertical line on 0.0°C/day. Important note – the values chosen here are not intended to represent our climate system. 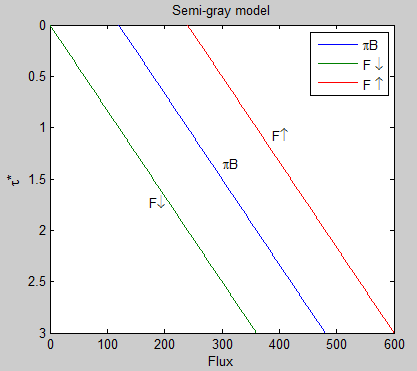 Figure 6 & 7, along with figure 3, are just to help readers “see” what a semi-grey model looks like. If we increase the total optical depth of the atmosphere the atmospheric temperature at the surface increases. Note as well that once the temperature reduction vs height is too large a value, the atmosphere will become unstable to convection. E.g. for a typical adiabatic lapse rate of 6.5 K/km, if the radiative equilibrium implies a lapse rate > 6.5 K/km then convection will move heat to reduce the lapse rate. Note, that in obtaining B0 , the fact of the semi-infinite integration domain over the optical depth in the formal solution is widely used. For finite or optically thin atmosphere Eq. (15) is not valid. In other words, this equation does not contain the necessary boundary condition parameters for the finite atmosphere problem. The B0 he is referring to is the constant in [M15]. This constant is H/2π – where H = F0 (absorbed solar radiation) in my earlier notation. This constant B0 later takes on magical properties. Eq. (15) assumes that at the lower boundary the total flux optical depth is infinite. 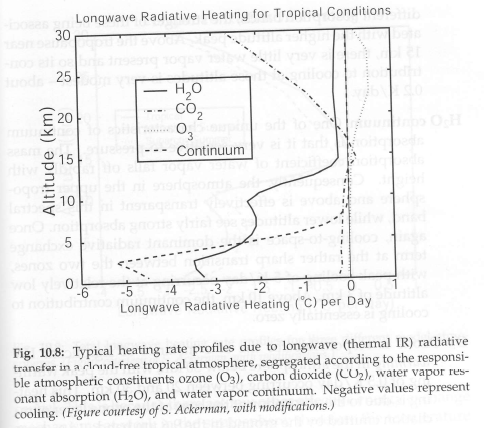 Therefore, in cases, where a significant amount of surface transmitted radiative flux is present in the OLR , Eqs. (16) and (17) are inherently incorrect. In stellar atmospheres, where, within a relatively short distance from the surface of a star the optical depth grows tremendously, this could be a reasonable assumption, and Eq. (15) has great practical value in astrophysical applications. The semi-infinite solution is useful, because there is no need to specify any explicit lower boundary temperature or radiative flux parameter (Eddington, 1916). The equations can easily be derived without any requirement for the total optical depth being infinite. There is no semi-infinite assumption in the derivation. Whether or not some early derivations included it, I cannot say. But you can find the SGM derivation in many introductions to atmospheric physics and no assumption of infinite optical thickness exists. When considering the clear-sky greenhouse effect in the Earth’s atmosphere or in optically thin planetary atmospheres, Eq. (16) is physically meaningless, since we know that the OLR is dependent on the surface temperature, which conflicts with the semi-infinite assumption that τA =∞.. ..There were several attempts to resolve the above deficiencies by developing simple semi-empirical spectral models, see for example Weaver and Ramanathan (1995), but the fundamental theoretical problem was never resolved.. This is the reason why scientists have problems with a mysterious surface temperature discontinuity and unphysical solutions, as in Lorenz and McKay (2003). To accommodate the finite flux optical depth of the atmosphere and the existence of the transmitted radiative flux from the surface, the proper equations must be derived. 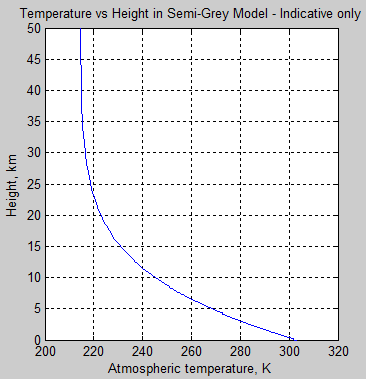 The deficiencies noted include the result in the semi-gray model of a surface air temperature less than the ground temperature. If you read Weaver and Ramanathan (1995) you can see that this isn’t an attempt to solve some “fundamental problem“, but simply an attempt to make a simple model slightly more useful without getting too complex. The mysterious surface temperature discontinuity exists because the model is not “full bottle”. The model does not include any convection. This discontinuity is not a mystery and is not crying out for a solution. The solution exists. It is called the radiative-convective model and has been around for over 40 years. Miskolczi makes some further comments on this, which I encourage people to read in the actual paper. We now move into Appendix B to develop the equations further. The results from the appendix are the equations M20 and M21 on page 14. The intensity at the top of atmosphere equals.. The surface radiation attenuated by the transmittance of the atmosphere, plus..
For those wanting to understand the maths a little bit, the 3/2 factor that appears everywhere in Miskolczi’s equation B1 is the diffusivity approximation already mentioned (and see note 2) where we need to sum the radiances over all directions to get flux. Now this equation is the complete equation of radiative transfer. If we combine it with a simple convective model it is very effective at calculating the flux and spectral intensity through the atmosphere – see Theory and Experiment – Atmospheric Radiation. So equation B1 in M2007 cannot be solved analytically. This means we have to solve it numerically. 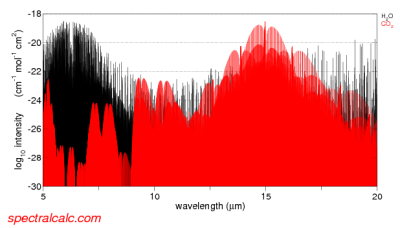 This is “simple” in concept but computationally expensive because in the HITRAN database there are 2.7 million individual absorption lines, each one with a different absorption coefficient and a different line width. However, it can be solved and that is what everyone does. Once you have the database of absorption coefficients and the temperature profile of the atmosphere you can calculate the solution. And band models exist to speed up the process. The author now takes the equation for the “source function” (B) from the simple model and inserts it into the “complete” solution. The “source function” in the complete solution can already be calculated – that’s the whole point of the equation B1. But now instead, the source function from the simple model is inserted in its place. 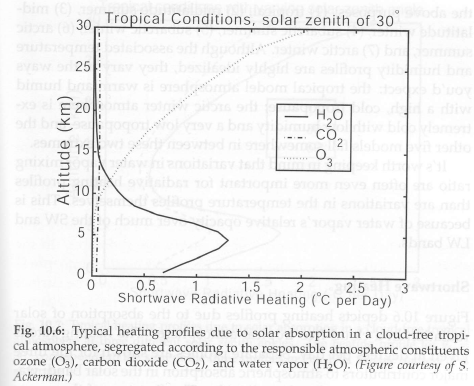 This equation assumes that the atmosphere has no convection, has no variation in emissivity with wavelength, has no solar absorption in the atmosphere, and where the heating rate at each level in the atmosphere = zero. This appears to be one of the sources of confusion for Miskolczi, for later comment. Equation M13 is derived for zero heating rates throughout the atmosphere, and therefore constant H. With this simple assumption – and only for this simple assumption – the equation M13 is a valid solution to “the source function”, ie the atmospheric temperature and radiance. If you have the complete solution you get one result. If you have the simple model you get a different result. If you take the result from one and stick it in the other how can you expect to get an accurate outcome? If you want to see how various atmospheric factors are affected by changing τ, then just change τ in the general equation and see what happens. You have to do this via numerical analysis but it can easily be done..
As we continue on working through the appendix, B6 has a sign error in the 2nd term on the right hand side, which is fixed by B7. This B0 is the constant in the semi-gray solution. The constant appears because we had a differential equation that we integrated. And the value of the constant was obtained via the boundary condition: upward flux from the climate system must balance solar radiation. So we know what B0 is.. and we know it is a constant.. If someone wants to explain what thermodynamic principle create the first statement – I would be delighted. Without any explanation it is a jumble of words that doesn’t represent any thermodynamic principle. Anyway B0 is a constant and is equal to approximately 240 W/m². Therefore, if we differentiate it, yes the value dB0/dτ=0. Unfortunately, the result in B10 is wrong. If we differentiate a variable we can’t assume it is a constant. The variable in question is BG. This is the “source function” for the ground, which gives us the radiance and surface temperature. Clearly the surface temperature is a function of many factors especially including optical thickness. Of course, if somewhere else we have proven that BG is a constant then dBG/dτ=0. It has to be proven. [And thanks to DeWitt Payne for originally highlighting this issue with BG, as well as explaining my calculus mistakes in an email]. We will consider just the last term in equation [B9]. This term = BG/(eτ-1). I have dropped the π from the term to make it simpler to read what is happening. This assumes that f and g are both functions of x. If, for example, f is not a function of x, then df/dx=0 (this just means that f does not change as x changes). And so the result reduces to d(fg)/dx = f.dg/dx. You can see the 2nd half of this expression as the first term in [B10], multiplied by π of course. But the term for how the surface radiance changes with optical thickness of the atmosphere has vanished. Where the red text is my correction (see eqn 7 in the digression). Perhaps the idea is that if we assume that surface temperature doesn’t change with optical thickness then we can prove that surface temperature doesn’t change with optical thickness. Well, we can see that B11 isn’t true. In fact, even apart from the missing term in B10, the equation has been derived by combining two equations which were derived under different conditions. As we head back into the body of the paper from the appendix, equations B7 and B8 are rewritten as equations [M20] and [M21]. We could not find any references to the above equations in the meteorological literature or in basic astrophysical monographs, however, the importance of this equation is obvious and its application in modeling the greenhouse effect in planetary atmospheres may have far reaching consequences. Readers who have made it this far might realize why he is the first with this derivation. Continuing on, more statements are made which reveal some of the author’s confusion with one part of his derivation. The SGM model is derived by integrating a simple differential equation, which produces a constant. The boundary conditions tell us the constant. So now H is a function of optical depth in the atmosphere? Refer to my equation 1 and you will see they are the same. The only way this equation can be derived is with H as a constant, because the atmosphere is in radiative equilibrium. If H isn’t constant you have a different equation – M13 and 15 are no longer valid. ..The fact that the new B0 (skin temperature) changes with the surface temperature and total optical depth, can seriously alter the convective flux estimates of previous radiative-convective model computations. Mathematical details on obtaining equations 20 and 21 are summarized in appendix B.
Miskolczi has confused himself (and his readers). There is an equation of radiative transfer and it is equation B1 in the appendix of M2007. This equation is successfully used to calculate flux and spectral intensity in the atmosphere. There is a very simple equation of radiative transfer which is used to illustrate the subject at a basic level and it is called the semi-grey model (or the Schwarzschild grey model). With the last few decades of ever increasing computing power the simple models have less and less practical use, although they still have educational value. Miskolczi has inserted the simple result into the general model, which means, at best, it can only be applied to a “grey” atmosphere in radiative equilibrium, and at worst he has just created an equation soufflé. The constant in the simple model has become a variable. Without any proof, or re-derivation of the simple model. One of the important variables in the simple model has become a constant and therefore vanished from an equation where it should still reside. Many flawed thermodynamic concepts are presented in the paper, some of which we have already seen in earlier articles. I think I was the first who showed the Aa~=Ed relationship with reasonable quantitative accuracy. Eq. 7 simply states, that the sum of the Su-OLR and Ed-Eu terms – in ideal greenhause case – must be equal to Fo. I assume that the complex dynamics of the system may support this assumption, and will explain the Su=3OLR/2 (global average) observed relationship. You are right, I should have told that, and in my new article I shall pay more attantion to the full explanations. However, some scientists figured it out without any problem. Party people who got the joke right off the bat..
M07 also introduces the idea that kinetic energy can be equated with the flux from the atmosphere to space. See Part Three. Introductory books on statistical thermodynamics tell us that flux is proportional to the 4th power of temperature, while kinetic energy is linearly proportional to temperature. We have no comment from the author on this basic contradiction. This pattern indicates an obvious problem. In summary – this paper does not contain a theory. Just because someone writes lots of equations down in attempt to back up some experimental work, it is not theory. If the author has some experimental work and no theory, that is what he should present – look what I have found, I have a few ideas but can someone help develop a theory to explain these results. Obviously the author believes he does have a theory. But it’s just equation soufflé. New Theory Proves AGW Wrong! – a guide to the steady stream of new “disproofs” of the “greenhouse” effect or of AGW. And why you can usually only be a fan of – at most – one of these theories. 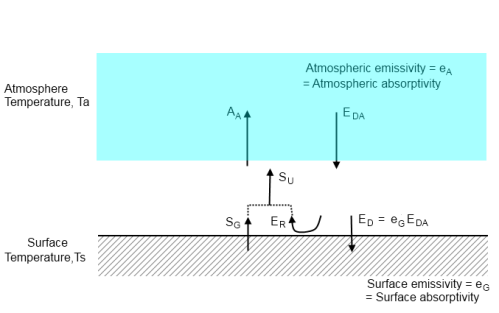 Note 2 – this diffusivity approximation is explained further in Understanding Atmospheric Radiation and the “Greenhouse” Effect – Part Six – The Equations. In M2007 he uses a different factor, τ* = τ . 3/2 – this differences are not large but they exist. The problems in M2007 are so great that finding the changes that result from using different values of τ* is not really interesting. In Part Two we looked at the claimed relationship ED=AA in Miskolczi’s 2007 paper. I think I was the first who showed the AA≈ED relationship with reasonable quantitative accuracy. That is, there is not a theoretical basis for equating AA=ED as an identity. There is a world of difference between demonstrating a thermodynamic identity and an approximate experimental relationship. In the latter situation, it is customary to make some assessment of how close the values are and the determining factors in the relationship. Now the point I made in Part Two was that AA ≠ ED because the atmosphere is a little bit cooler than the surface – at the average height of emission of the atmosphere. So we would expect ED to be a a little less than AA. Please review the full explanation in Part Two to understand this point. Now take a look at the graph above. The straight line drawn on is the relationship ED=AA. The black circles are for an assumption that the surface emissivity, εG = 1. (This is reasonably close to the actual emissivity of the surface, which varies with surface type. The oceans, for example, have an emissivity around 0.96). Of course in practice, εG < 1. What happens then? Well, in the graph above, with εG = 0.96 the points appear to lie very close to the line of ED=AA. I think there is a calculation error in Miskolczi’s paper – and if this is true it is quite fundamental. Let me explain.. When the surface is a blackbody (εG =1), SU = SG – that is, the upwards radiation from the surface = the emitted radiation from the ground. The terms and equations in his 2007 are derived with reference to the surface emitting as a blackbody. When εG < 1, some care is needed in rewriting the equations. It looks like this care has not been taken and the open circles in his Fig 2 (my figure 1) closely matching the ED=AA line are an artifact of incorrectly rewriting the equations when εG < 1. That’s how it looks anyway. As much as possible I have reused Miskolczi’s terms. Because the surface is not a blackbody, the downward radiation emitted by the atmosphere is not completely absorbed. So I created the term EDA for the emission of radiation by the atmosphere. Then some of this, Er, is reflected and added to SG to create the total upward surface radiation, SU. Note as well that the relationship emissivity = absorptivity is only true for the same wavelengths. See note 4 in Part Two. Now for some necessary maths – it is very simple. All we are doing is balancing energy to calculate the two terms we need. 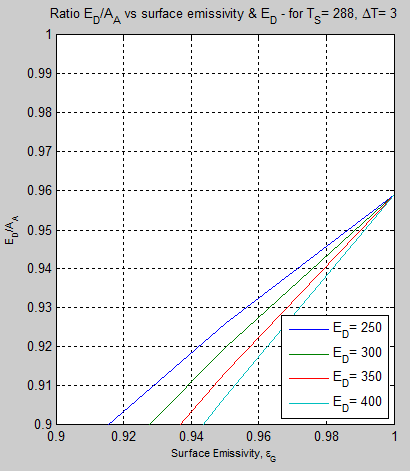 (Updated note – some of the equations are approximations – the real equation for emission of radiation is a complex term needing all of the data, code and a powerful computer – but the approximate result should indicate that there is an issue in the paper that needs addressing – see comment). And the objective is to get a formula for the ratio ED/AA – if ED=AA, this ratio = 1. 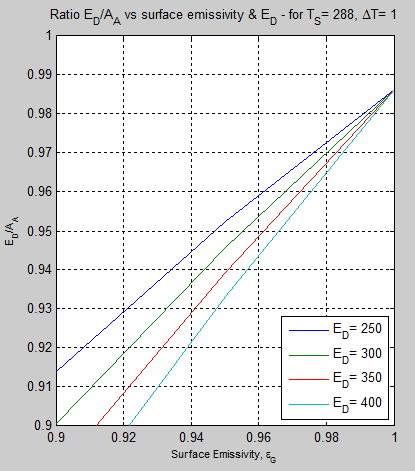 And remember that in Figure 1, the relationship ED/AA=1 is shown as the straight line. where ΔT represents the idea of a small change in temperature. We are almost there. Remember that we wanted to find the ratio ED/AA. Unfortunately, the AA term includes ED and we can’t eliminate it (unless I missed something). We didn’t make a blackbody assumption, it is just that most of the emissivity terms canceled out. Which is very simple. If ΔT = 0 then ED/AA = 1. Compare this with figure 1 (Miskolczi’s fig 2). Note: I could have just cited the ratios of ED/AA, which – in this graph – are constant for each value of ΔT. And we can easily see that as ΔT →0, ED/AA →1. This is “obvious” from the maths for people more comfortable with equations. That’s the simplest stuff out of the way. Now we want to see what happens when εG < 1. This is the interesting part, and when you see the graph, please note that the axes are not the same as figure 4. In figure 4, the graph is of ED vs AA, but now we will plot the ratio of ED/AA as other factors change. Take a look back at equation 8a. To calculate the ratio we need a value of Ed, which we don’t have. So I use some typical values from Miskolczi – and it’s clear that the value of Ed chosen doesn’t affect the conclusion. You can see that when εG = 1 the ratio is almost at 0.99. This is the slope of the top line (ΔT=1) in figure 4. This is clear from equation 8a – as εG reduces below 1, the second term in the denominator of equation 8a increases from zero. As this increases, the ratio must reduce. In Miskolczi’s graph, as εG changed from 1.0 → 0.96 the calculated ratio increased. I believe this is impossible. Perhaps I made a mistake in the maths. It’s pretty simple – and out there in the open, so surely someone can quickly spot the mistake. Of course I wouldn’t have published the article if I thought it had a mistake..
On conceptual grounds we can see that as the emissivity of the surface reduces, it absorbs less energy from the atmosphere and reflects more radiation back to the atmosphere. This must reduce the value of ED and increase the value of AA. This reduces the ratio ED/AA. 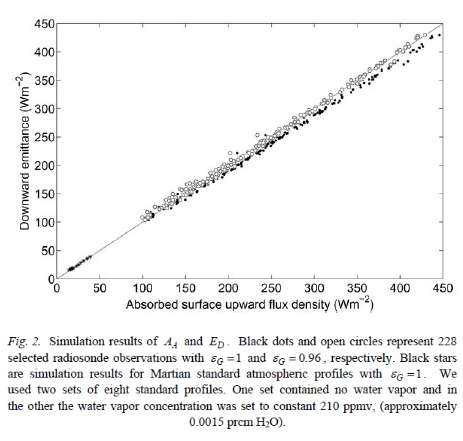 In Miskolczi’s 2007 paper he shows that as emissivity is reduced from a blackbody to a more realistic value for the surface, the ratio goes in the other direction. If my equations are correct then the equations of energy balance (for his paper) cannot have been correctly written for the case εG <1. This one should be simple to clear up. Update May 31st – Ken Gregory, a Miskolczi supporter appears to agree – and calculates ED/AA=0.94 for a real world surface emissivity.